Happy New Year!! Better late than never, right? 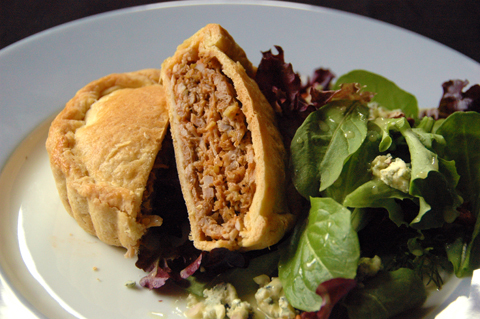 As you can see, these empanadas are more like a pot pie, however the filling is quite different. It's not soupy but rather dense and savory on account of green olives. The crust is very buttery and flaky. 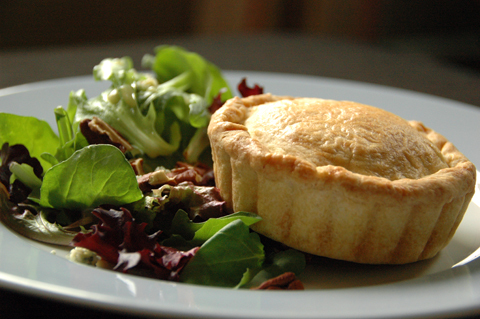 The result is a hearty meat pie that is perfect served with a side salad. If you have a mini-muffin pan (and the patience) you could make a bunch of these to share at a gathering. The easiest way to make the crust is with a food processor. If you don't have a food processor, this can be done by hand using a fork. Combine the dry ingredients with the butter and pulse until the butter is cut into the flour. Add one whole egg and the yolk of the other and pulse until they are incorporated. Pulse while adding enough cold water to just bring the dough together. Transfer to a clean surface and bring the dough together into a clump. If it's too sticky add a little more flour. If it's too dry, add a little more liquid, but do not knead it. Wrap the clump in plastic wrap and chill it in the fridge while you make the filling. For the filling, I used left over chicken. Use dark or white meat or a combination of both. In a skillet, sautee the onions until soft. Add the olives, hearts of palm or artichokes and tomato paste. Mix well. Sprinkle the flour on top and stir to incorporate it. Add the broth slowly in increments. Mix well after each addition. Use just enough liquid to get a pasty filling. Heat through and season with salt. Now it's ready to use. To assemble the pies, roll out the dough to fit into the mini-pie pans so there is a little overhang. You'll also need a top. The dough is not very sticky, but you may need to lightly sprinkle flour on it every few passes. Roll out the dough as thin as you want, but not so thin that it breaks apart when you try to lift it or lay it in the mold. For the best results, use enough of the meat mixture to fill a little over the level of the mold, being sure to press down gently to compact the filling. Place the top on and pinch the top and bottom crusts together. To keep the pies from popping open, roll the seam inward (see photo). Alternatively, you could go for the traditional half circle shape. Be sure to pinch and roll the seam shut. If you just pinch the seam the empanada will come open during baking. Brush lightly with egg white and bake in 375F oven until golden, about 25 to 30 minutes. Serve warm or at room temperature. This is my submission to Regional Recipes. The spotlight region is Brazil. If you'd like to participate, please send your submissions to blazinghotwok(at)gmail(dot)com by January 15th. Also, if you have participated in the past and would like to host, just let me know and I'll put you on the list.